Who would win in a fight between Batman and The Green Arrow?? As an avid comic book fan, I’ve always taken part in heated debates with friends and fellow comic lovers about who’d win in fights between our favorite characters in the DC roster, Wikipedia entries were referenced and hours spent digging through stacks of paper backs just to find that one single panel that proves your theory. These debates are going to be a thing of the past because Injustice: Gods Among Us is finally here to help us settle once and for all, who would win in a fight between Batman and Superman. 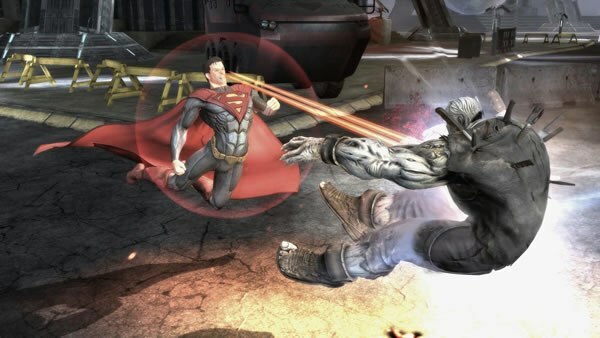 Helmed by veteran developers NetherRealm Studios who are better known for the prolific Mortal Kombat franchise, Injustice: Gods Among Us is a 2.5D fighting game with a roster of 24 characters drawn from the massive DC universe. The game itself feels like an amalgamation of the already proven Mortal Kombat fighting system, the absurdly flashy moves from Marvel Vs Capcom and more sticky gooey DC fan service than you can shake a Batarang at. The DC universe has always been celebrated for their original stories and Injustice does justice to the source material by doing something that very few fighting games are able to do; Injustice is able to tell a remarkable tale of vengeance, guilt and complexities of life as a metahuman. What would happen if one day, Superman lost his sanity and sense of morality after the death of Lois Lane and their unborn baby at the hands of the Joker. Superman finally came to the conclusion that the best way to protect the Earth was to rule it with an iron fist; once the guardian of Metropolis, Kel-El became the High Councilor of the One Earth government. The decision shook the very foundation of the DC universe itself and before you know it, the heroes and villains of the DC universe are forced to pick a side, former allies became enemies and uneasy alliances were formed. On one side you have Superman and his coalition of heroes and villains who support his repressive rule while on the other, Batman who did not take too kindly to Superman’s despotic rule joined forces with a ragtag collection of heroes and villains to topple Superman’s regime. The narrative in Injustice might be short and simple but it delves into the more complex psychologies of metahumans, their powerful exterior conceals a fragile human psyche. When all’s set and done, it’s time for the fist/sword/bow/sticks/guns to do the talking and it’s here that Injustice truly shine. Injustice’s fighting system is based off Mortal Kombat 9 but minor tweaks were made towards making the game more accessible for more “traditional” and casual gamers. NetherRealms scrapped the old MK controls scheme (2 punches, 2 kicks) for a simpler and more streamlined Light, Medium and Heavy system. What sets Injustice apart is the inclusion of the “character ability” button, which activates the unique ability of each character – something like the drive button we’ve seen in Blazblue. These abilities could be as simple as increased damage to complete stance changes. Like Mortal Kombat. each hit feels beefy and heavy, fists clash into faces with a satisfyingly heavy thud. The block button in MK9 have since been replaced with a more traditional “back to block” system which totally changed the dynamics of the game itself as cross-ups are finally viable. Myriads of additions and tweaks were added to the fighting system to separate itself from being a re-skinned version of MK9. First of which is the clash system that immediately breaks the attack and lets you wager portions of your super meter to deal or heal damage. The background of the stages that you are fighting in are also be used as weapons with the inclusion of the background interact button – see a shiny new piece of furniture, with a push of the interact button, you could introduce said furniture to your opponent’s face. Injustice is more than a re-skinned adaptation of MK9, sure it might share the same parentage but the main draw of the game is still the wild super moves and interactive backdrops. It would be a grave injustice (pun intended) to give this game a miss, fighting games and DC fans would find much to love in this gem of a game.